October 29 is celebrated as Ľudovít Štúr's birthday in Slovakia. This official remembrance day is dedicated to the leader of the Slovak national revival who is credited with developing the Slovak language standard. 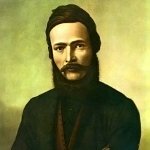 Ľudovít Štúr was born on October 29, 1815 in the village of Uhrovec in the Kingdom of Hungary. In 1829, he began his studies at the prestigious Lýceum in Pressburg (present day Bratislava) and joined the Czech-Slav Society. In 1835, Štúr became involved in the Slovak national movement. Originally he intended to create a unified Czechoslovak language. However, the Czech were unwilling to cooperate, so he began to develop a new language standard for the Slovak language with the help of other members of the Czech-Slav Society. The first works on the new Slovak language standard were published in 1844. Two years later, Štúr published the first Slovak grammar that used the new standard. In 1851, Štúr took part in meetings concerning a reform of the his codified Slovak language standard. The final variant of the standard was approved in 1852. Ľudovít Štúr's contribution to Slovak culture is immense, no wonder his birthday was designated as an official remembrance day. However, it is not a public holiday.